Now there’s a way to stay calm and focused without resorting to junk food, yoga class, pills or psychobabble therapy! In this Muse Headband review we will tell you all you need to know about this super new state-of-the-art wearable gadget. The Muse Headband (made by InteraXon) promises relaxation, focus and calm, but what is it really? Some kind of new-age mind-altering device? Don’t worry; it’s nothing of the kind. The aim of the Muse is to teach you how to alter your thoughts and perceptions yourself, so that you can stay calm and focused, come hell or high water. The Muse is really easy to use. It looks like a headset, with an elegant, unobtrusive elastic band running across the forehead that’s tucked behind the ears. After you set up the device (more on this in just a bit), you will have to do some breathing exercises with a variety of sounds in the background. These are bird sounds, wave sounds and the sounds of a storm. If you are stressed and your mind isn’t calm, you will hear the storm pick up. You will also hear loud winds or crashing waves. If you are relaxed, you will hear the sound of chirping birds. What you should try to do is clear your mind – that’s what the Muse’s signals are there for. The Muse Headband is to be connected via Bluetooth to your tablet or Smartphone. It supports both iOS (version 6.1 and above) and Android (version 4.0 and above). You only have to do this one time. The setup starts with some instructional videos. The Muse calibrates to obtain data of your brain functions. The meditation sessions of the Muse vary in length. They can be as short as three minutes or as long as twenty minutes depending on your needs. As Ariel Garten stated in an interview with CNN, the Muse was developed on the basis of electroencephalography (EEG) technology, a method of measuring electrical activity in your brain. The difference between the Muse and an EEG you would find in the hospital is that the former doesn’t necessitate the use of wires. What a relief, right? Your brain activity is traced and followed via sensors that are built into the device. The band is adjustable, so you’ll probably find it pretty comfortable to wear, which is really important for measurements to be accurate. If your brain is sending the Muse signals that you are relaxed, what you will hear are calm winds. If you are agitated or stressed, the winds will get louder. The purpose of the exercise is to make the winds stay calm. This is a way of learning how to relax and stay focused. If you hear the sound of birds, that means you have been calm for a sufficient period of time. You will also view a graphical representation of your state of mind after the session! The more often you hear birds, the more points the Muse gives you. This way you can set targets for yourself. The medals, charts and points the headband offers will encourage you on your road to serenity. Muse Headband review – what are the benefits? It is believed that the Muse headband can help reduce anxiety and irritability and improve the quality of sleep. The graphical representation shows whether you are generally more relaxed in the morning or afternoon, which can be quite useful. The Muse can substitute yoga because it is far more convenient. You don’t have to fit yoga classes into your schedule and worry about not making it on time. You can use the Muse whenever you feel like it and have time. Even better than other popular techniques the Muse helps your brain to stay focused and concentrate on just one single thing. The targets you set up on the Muse can be changed, which is also very beneficial because some people tend to lose interest when nothing new is happening. It is important to avoid boredom setting in, because this can start a rollercoaster of emotions about not completing yet another goal that you had set out to. If your life is really stressful, spending twenty minutes a week listening to calming sounds will be a great idea. Users report feeling really calm after each session with the Muse. They also report the app’s being really professional when it comes to sensing movement. All motions and fidgeting are reflected in the respective sounds that you hear. Finally, the fact it charges easily is not one lightly to be disregarded. Without any drawbacks this muse headband review would not be complete. 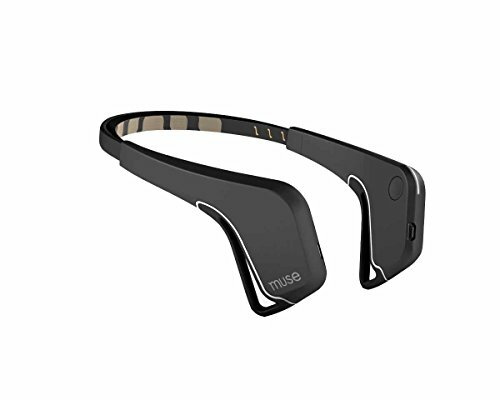 So of course the Muse Headband does not have GPS or heart rate tracking functionality like those fitness trackers you see in our comparison list. It isn’t clear whether there are any long-term benefits from Muse, although this would of course depend on the amount of effort you are willing to put in. Also, the Muse is sadly not targeted at a terribly wide scope of users – medical experts recommend seeing a health professional for more serious problems. What’s more, some users report brain sensing not being completely accurate. Finally, we don’t recommend using it when you go outside because it can easily get knocked off your head. Muse is a great way to increase your interest in meditation if you are just starting out with such practices. The advanced meditator will appreciate the product’s enabling him/her to attain clearer insight into the variability of mental states. Meditation coaches will be able to better communicate with their students and their practices could be more effective this way. The Muse currently costs around 299 USD with one year warranty and a 30-day money-back guarantee. muse is your personal meditation assistant. Sometimes your mind is calm and sometimes it's active. muse will guide you to a calm mind. Muse is a great way to increase your interest and skills in meditation if you are just starting out with yoga techniques. Bionic Boots Review – Start Powerbocking now!